“It’s like Christmas!” my roommate exclaimed with mock excitement, as she dumped a veritable boatload of mail onto the table this past Friday night. The day’s haul was mostly junk: the PennySaver, catalogues nobody asked for, and credit card offers galore. But lo! 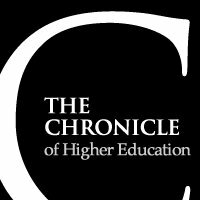 The most recent issue of The Chronicle of Higher Education had arrived! Christmas indeed! Side note: yes, I get the paper version of CHE. It’s not my fault; it was a gift. Don’t judge me. And then I saw the cover.